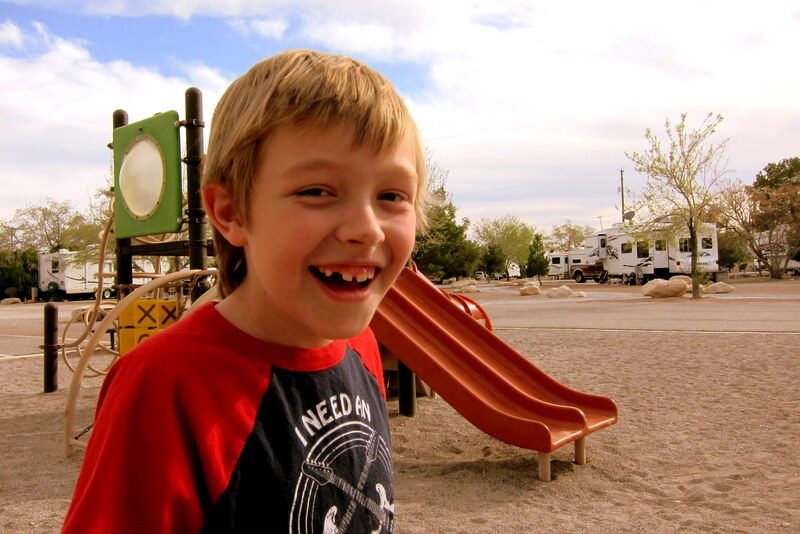 Friday, March 23, 2012: We reluctantly leave The Desert Eagle RV Park at Nellis Air Force Base and, more importantly we leave the hometown of our youngest, Suzie, her husband Kevin and our two special little guys, Jack and Tucker. It is sunny and 69 degrees as we head north out of Las Vegas on I-15. 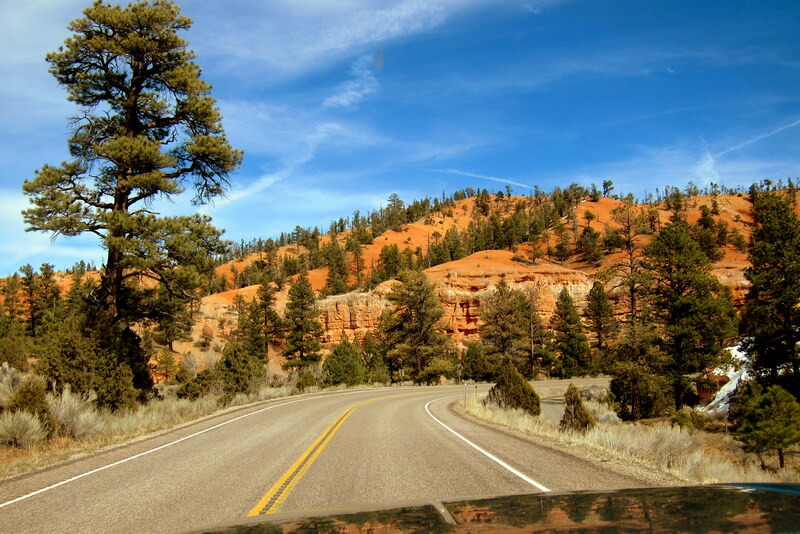 Within an hour we cross back into the Mountain Time Zone and enter the state of Utah, where we decided to pull off the road at Cedar City for fuel and lunch. Back on the road and tiring of I-15 we move over to UT-20 and started climbing into the mountains as we make our way through the Dixie National Forest. Transferring over to US-89 and then onto UT-12 we topped out at 7,920 feet before finding our way to Bryce Canyon National Park. Flashing our senior pass we motored through the gate and found the only campground open this time of the year was Loop A of the North facility. 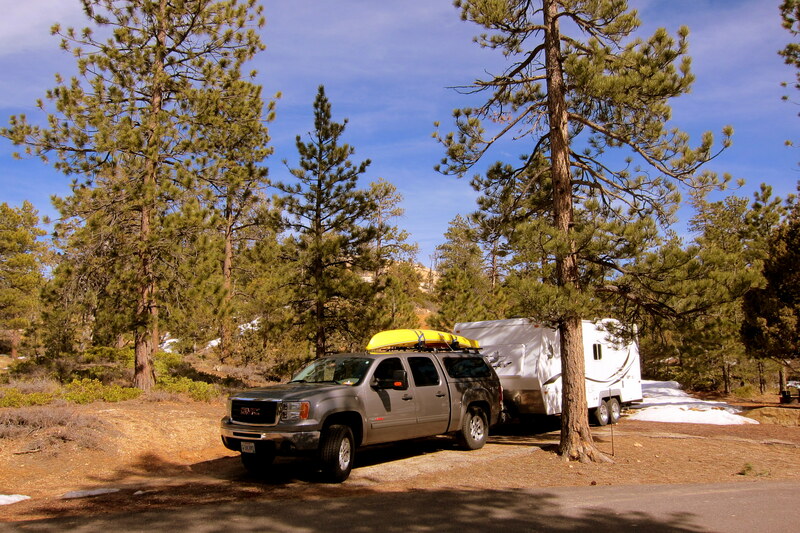 Being sparsely populated, we were able to select a nice secluded site for the next few days. Yep…..that’s snow in the background, the current temperature is 59 degrees but the overnights have been below freezing and a few spring storms have recently cycled through. 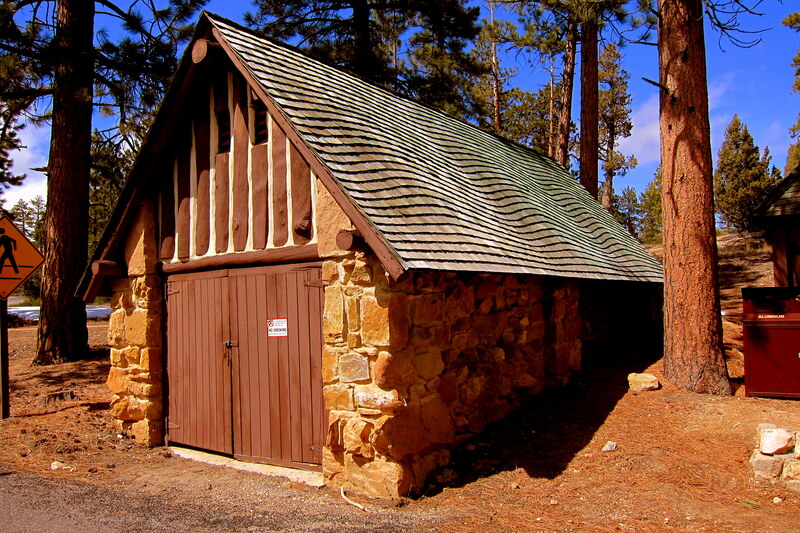 As in most National Park camping facilities, there are no hookups. However we will be fine in our cozy little camper. 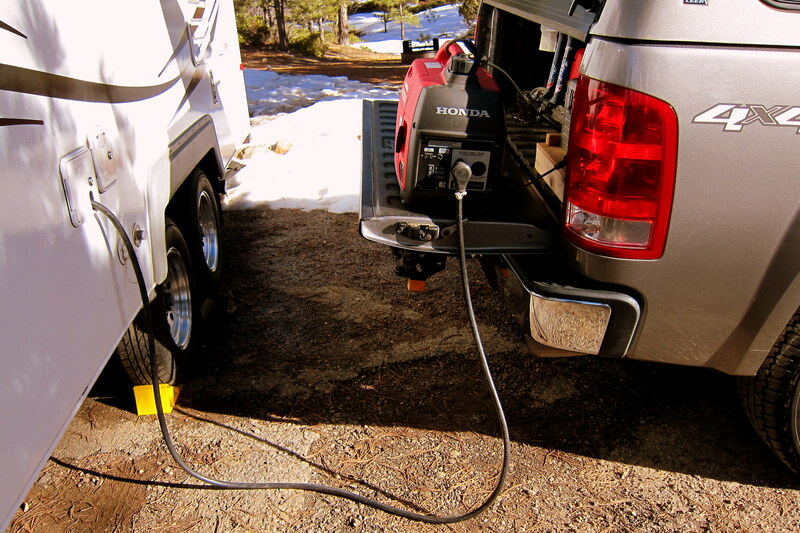 Besides…..we have the benefit of The Bill and Kit Power and Light Company if the batteries should run low. 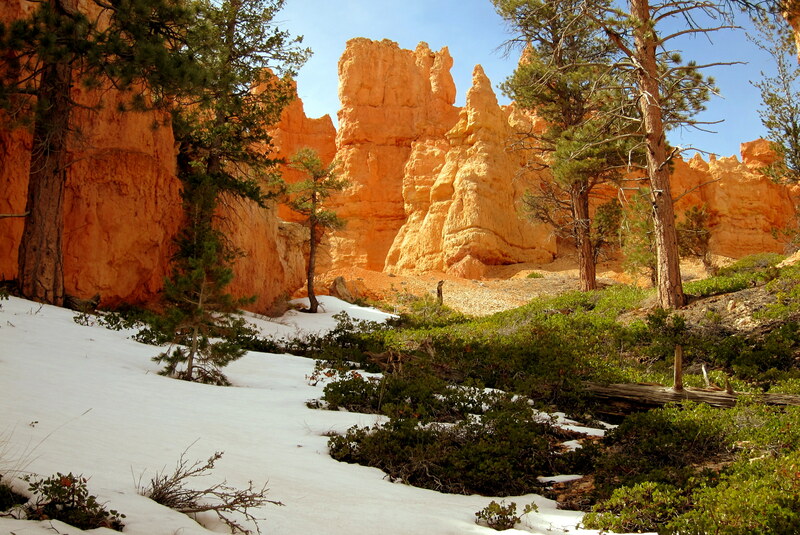 Saturday, March 24, 2012 through Monday, March 26, 2012-Bryce Canyon National Park: Over the three days we spent here, most mornings were clear and cool with temperatures in the 40’s, and the afternoons were relatively warm and pleasant. There were many birds and critters about, most too quick for me to capture on my camera. Out for my usual morning amble about a newly arrived at campground, I ran into this unusual and surprising sight a short distance away. This “trailer” was sitting in a campsite behind a Ford pickup. It was either the most unusual camper in the world or someone has a real beef with the National Park Service! 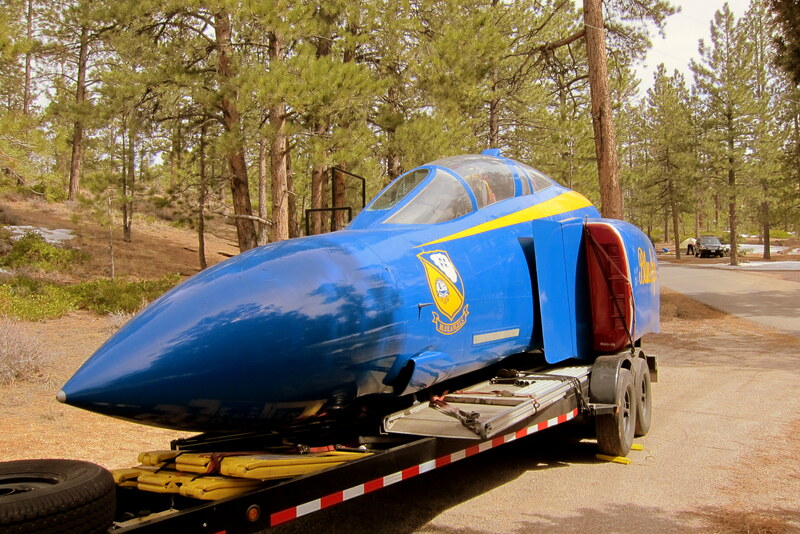 Turns out this front nose of an authentic military jet was a static display used at air shows. Colonel Steve, the gentleman that owned the jet bound trailer, was between shows and decided to spend a few days in the park. The fuselage is the front of an F-4 phantom from the Vietnam days. The canopy opens and folks can climb up, sit in one of the two seats, feel what it’s like to sit at the controls of a high performance jet and have their picture taken. Although the fuselage is not outfitted as a camper, Steve has thought of making it into one. While on the road he sleeps in his truck mounted camper. 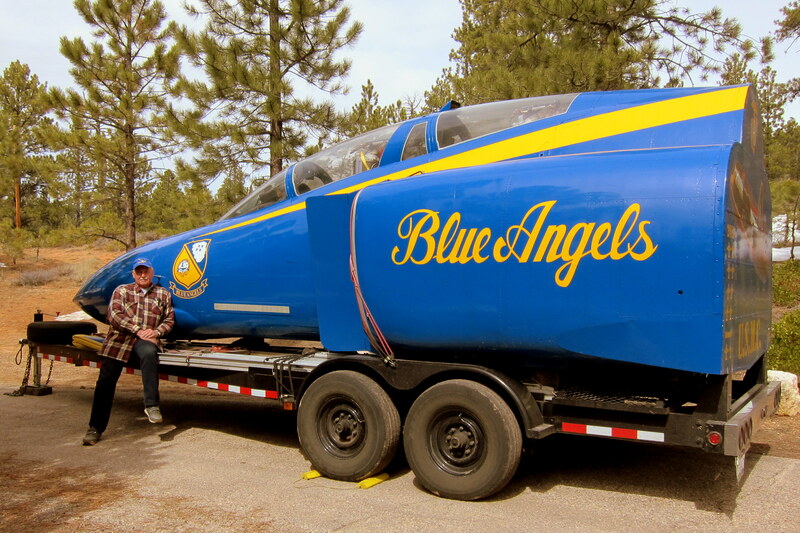 Oh, and Colonel Steve is retired Air Force…..he just thinks the graphics of the Blue Angels team made for better photography. 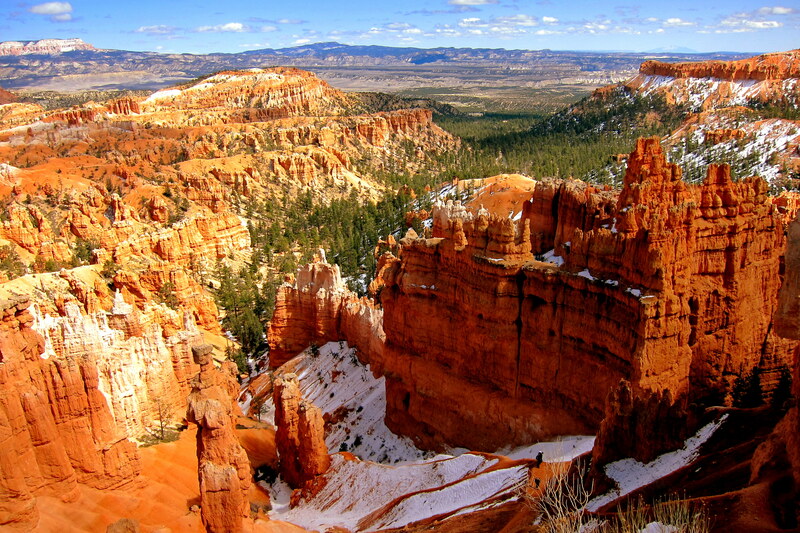 Bryce Canyon is the upper “step” of the Grand Staircase of the Colorado Plateau. 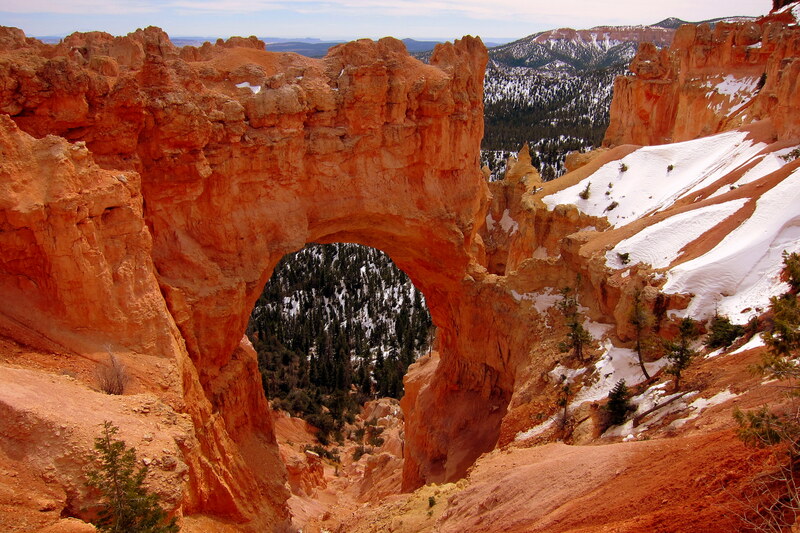 It is followed by Zion National Park and The Grand Canyon, which is the bottom step. 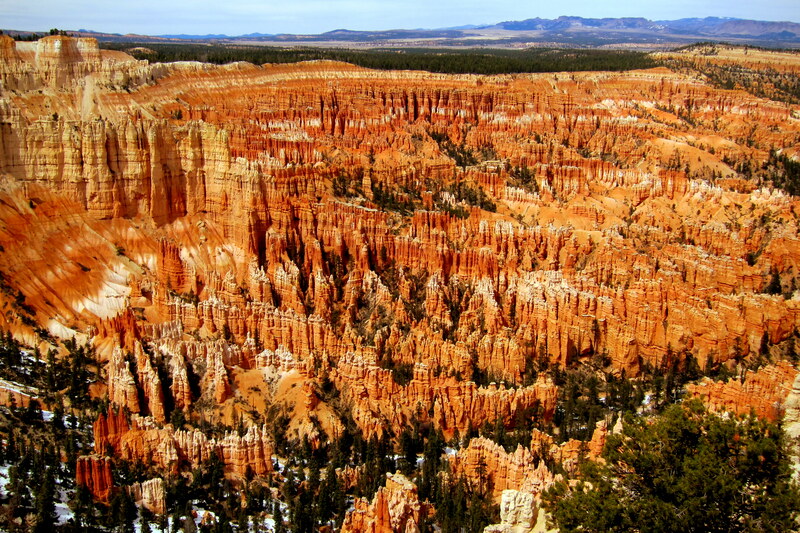 Ironically, the visitor’s center of Zion National Park is situated in a canyon and the ones in Bryce Canyon and The Grand Canyon are located on their rims. After making a few trips to each of these three jewels of the National Park system I can honestly say that my favorite is whichever I happen to be visiting at the moment. They are all incredible, individually unique and worthy of repeated visits! On the first morning at altitude I learned an important lesson about the physics of differential pressure. Apparently when one opens a container of Yoplait Strawberry-Banana Yogurt at an elevation of 8,000 feet that was purchased at a store down at 2,000 feet…..a very colorful and somewhat messy surprise awaits. Yea…..Kit wasn’t impressed. 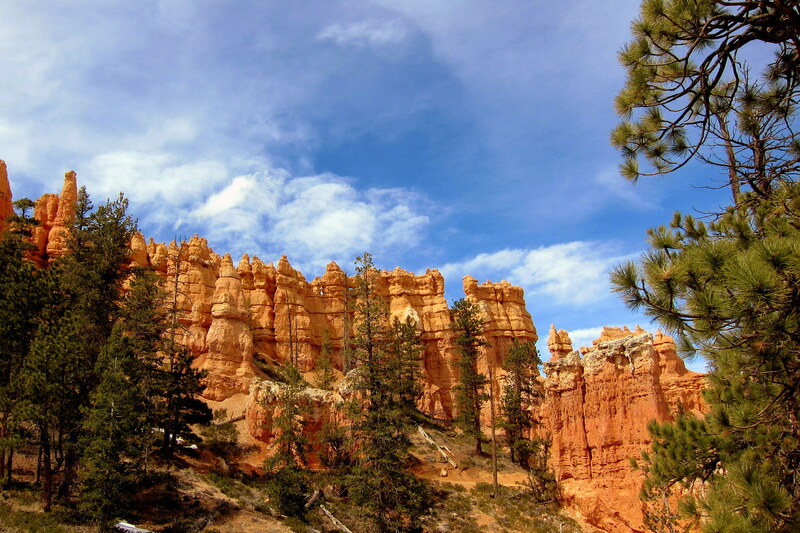 This is our second visit to Bryce Canyon National Park, the first being four years ago which was too short and we vowed to return and explore this remarkable region further. After a quick stop at the visitor’s center for information and maps we drove the 36 mile park road to get a feel for the park. 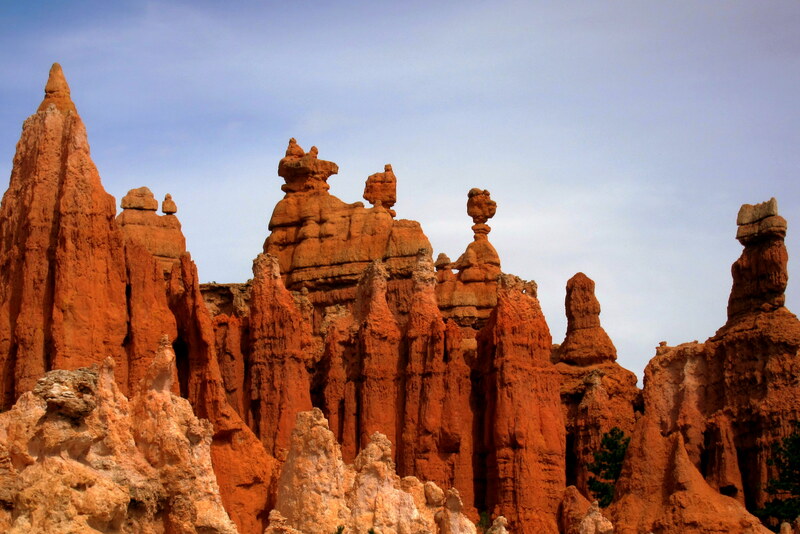 These fantastic geologic formations are called Fin’s, Spires, and my favorite formation, hoodoos, also called Fairy Rocks. 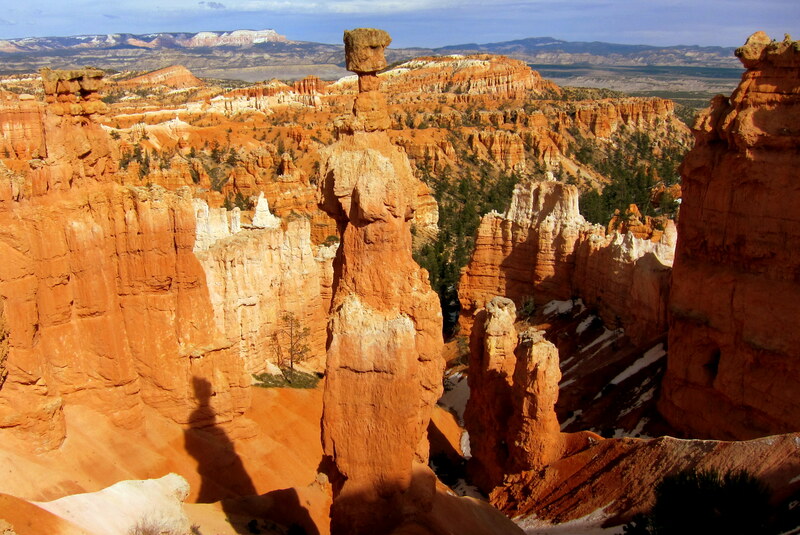 Hoodoos are tall thin towers of rock formed by the effect of rain and wind erosion on soft sedimentary rock. Normally all the soft rock material would be eroded away at the same rate, however in some areas there is an overlying deposit of harder “cap-rock” that prevents this. 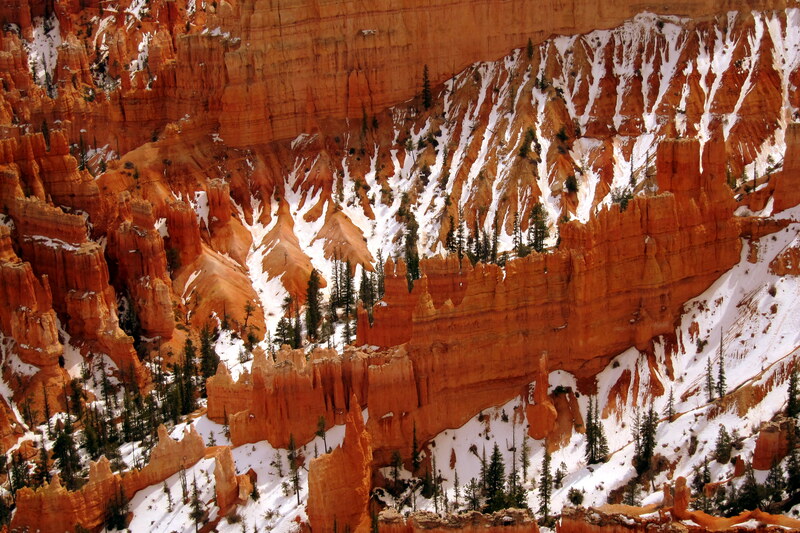 And after a few seasons of vertical cracking caused by freezing, the fins deteriorate further and form either hoodoos which are flat topped, or spires which are kinda pointy. This erosion process is ongoing and the terrain changes from year to year. 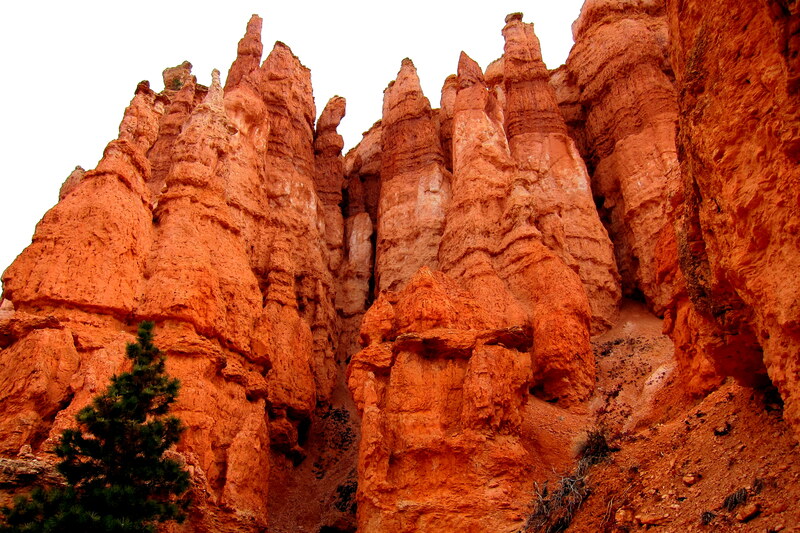 The red color comes from minerals trapped millions of years ago in the sedimentary layers of stone. 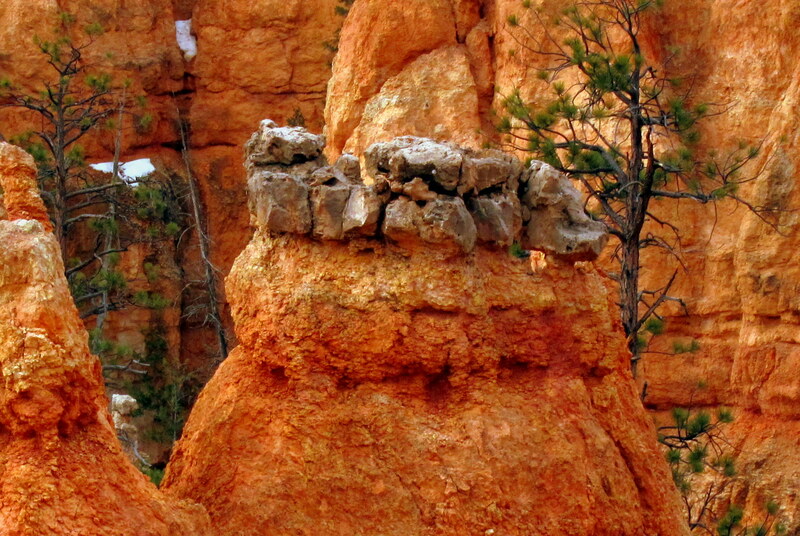 And, where hoodoos have little color there is less of these minerals. 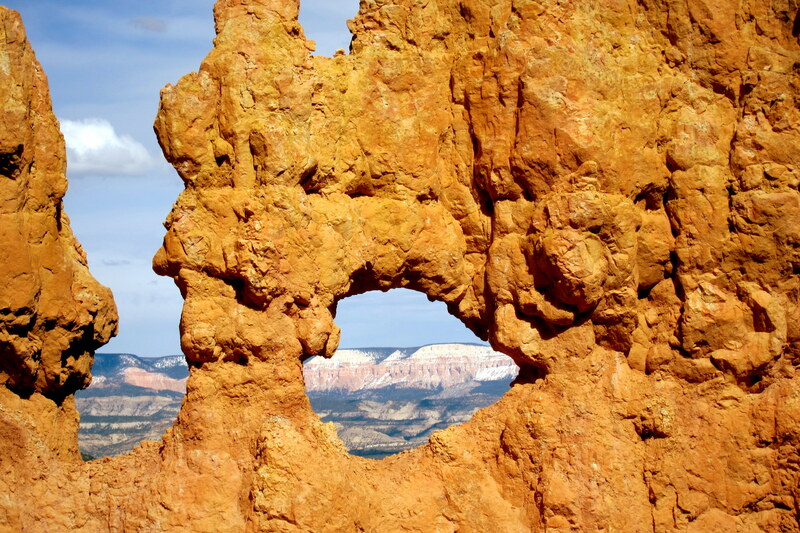 Occasionally during the rocks transformation from a fin to a hoodoo a unique formation evolves called a window. A misnomer because flowing water had little to do with the formations development…..rather it was the usual forces of erosion caused by wind and rain on the softest portions of the stone. One of the most photographed formations in the park is Thor’s Hammer……wonder how much longer before this pinnacle meets the same fate as new Hampshire’s Man in the Mountain formation did a few years back? Note the shadow cast by Thor’s Hammer on the below canyon wall……a lot of photography, at least for me, is just pure dumb luck! As incredible as the rock formations were, there was a lot more to keep our interest. 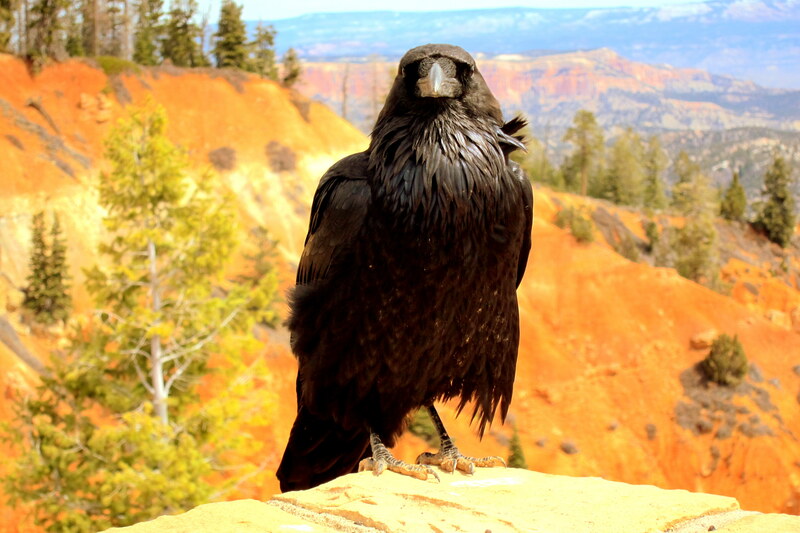 First off, at one of the overlooks, a pair of Raven were posing, much as models would. They were very used to folks gawking as I was able to get within about six feet to capture the following photo. His and/or her partner was a short distance away and didn’t appear to be very happy. I guess I should of offered them a few dollars…..what do I know, there were no hand lettered signs or a tin can or anything! 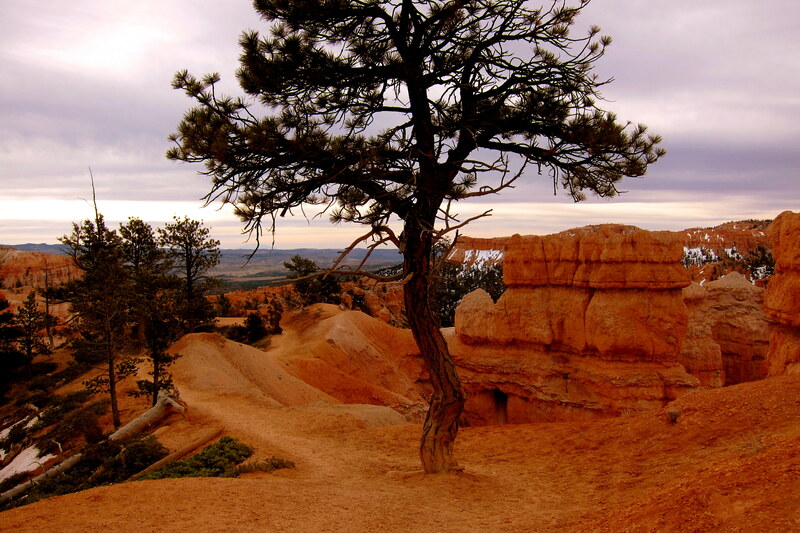 Bryce Canyon, as other area National Parks, were on the Union Pacific Railroads sights for a destination stop. So in 1924, the railroad folks built track to the park, constructed a lodge and started selling tickets. 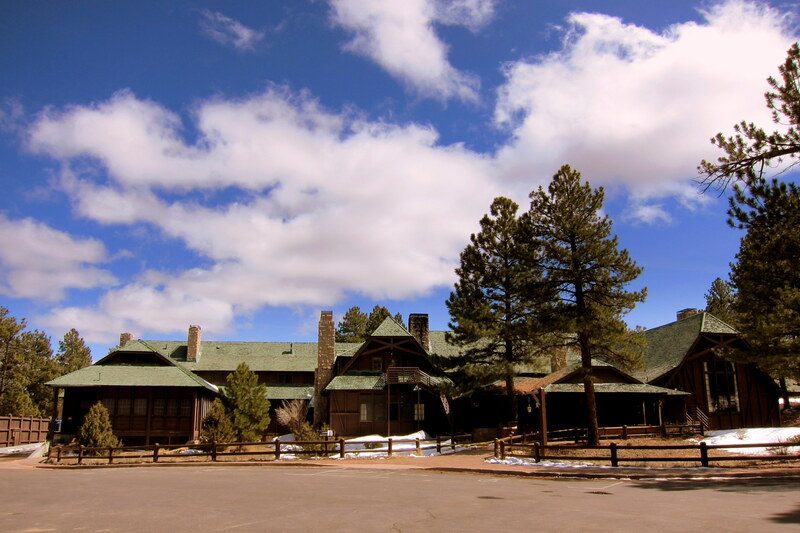 The rail lines are long gone but the lodge, and surrounding cottages are still accommodating guests. 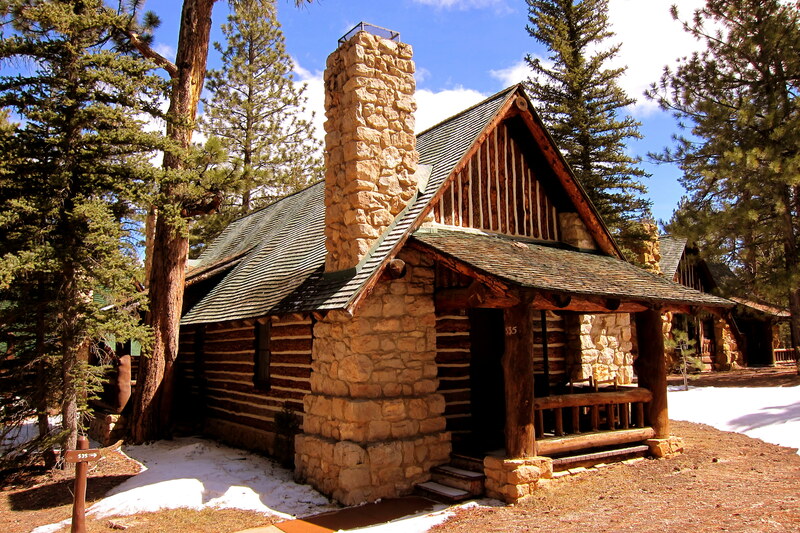 The lodge was built with local timbers and stone, try to do that in a National Park today, and the roofs feature a unique shingling pattern. Oh by the way, that roof is dead flat…..the wavy look is an optical illusion created by how the shingle courses were laid down. Pretty cool, huh? One of the days Kit wanted some quiet time…..which is my signal to go away and play. 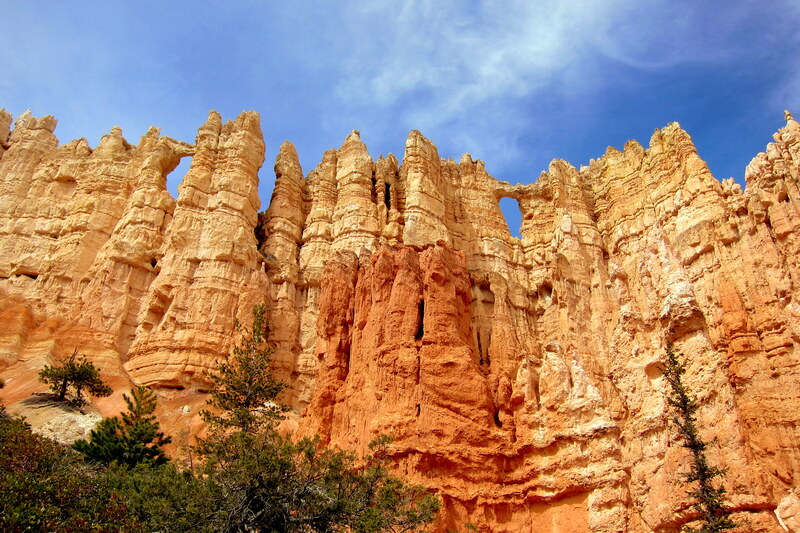 Since I had read that the two must-do’s while at Bryce Canyon National Park was to view the hoodoos under a full moon and the other being hiking to the bottom of the canyon to walk amongst them. Since a full moon was another week and a half away, that will have to wait until our next visit. However, with a whole day to myself a nice long hike was in the making. 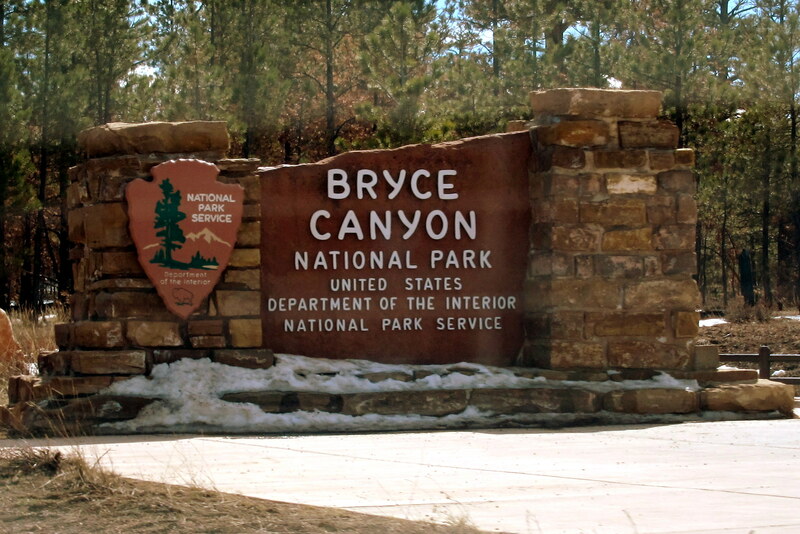 Stopping at the visitor’s center for more detailed maps and consultation with the very knowledgeable ranger, I mapped out a nice route that linked three of Bryce Canyon’s premier hikes into a loop trek of about eight miles…..and best of all, I could depart from our campsite! So at 0915, with pack, food, water and trekking poles I started off. The Rim Trail passed about 50 yards from the campsite and it connected with one of the below the rim paths called The Queens Garden Trail. I began to understand the attraction of hiking in this canyon as I dropped below the rim and became eye-to-eye with the formations. 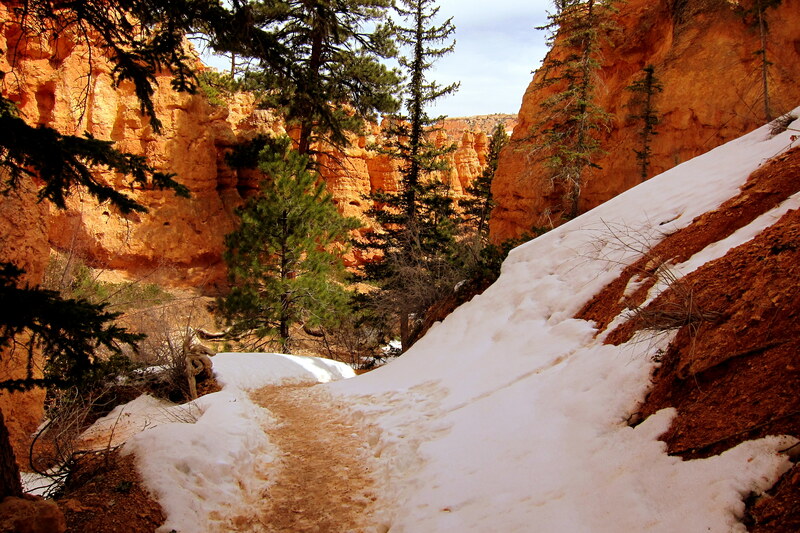 The path meandered through this incredible landscape as it descended some 600 feet over patches of snow and ice. 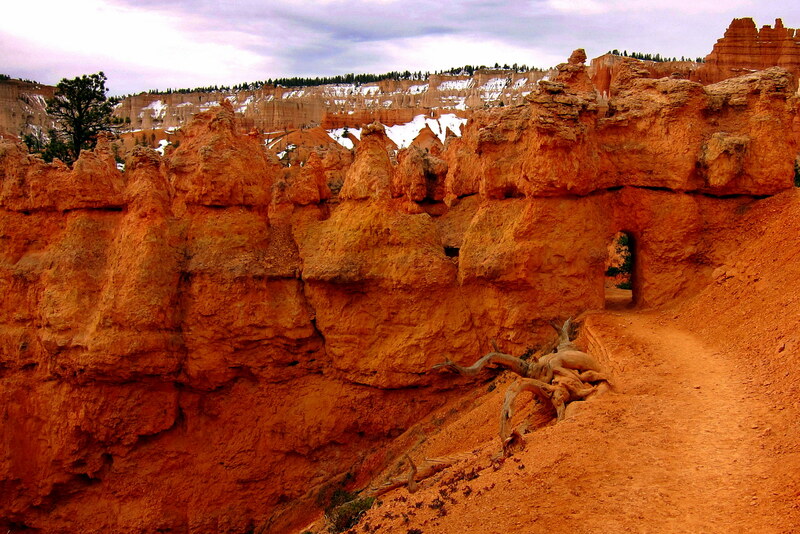 As I reached the cool canyon floor the Queens Garden Trail intersected with the Peekaboo Trail. From this unique vantage point the fins and hoodoo’s soared above my head…..making me appreciate the relative insignificance of man when in nature. Veering off on the Peekaboo Trail the path rose and fell in elevation…..
…..as it looped around the famous Cathedral Formation. And through narrow canyon passages. Where the trail could not go around, over or under a particular fin…..a tunnel had been carved. The following formation was shown earlier in the journal…..however it takes on a whole different look from this perspective. At midday, the sun reached into the canyon depths, the temperature rose rapidly and the formations seemed to glow. Along the trail there were many window’s…..this particular arrowhead shaped one caught my eye and camera. By midafternoon, I was climbing out of the canyon by way of the Navajo Trail. Once on top, I retraced my steps on the Rim Trail back to the campsite and spent the rest of the afternoon relaxing and reflecting on the day. 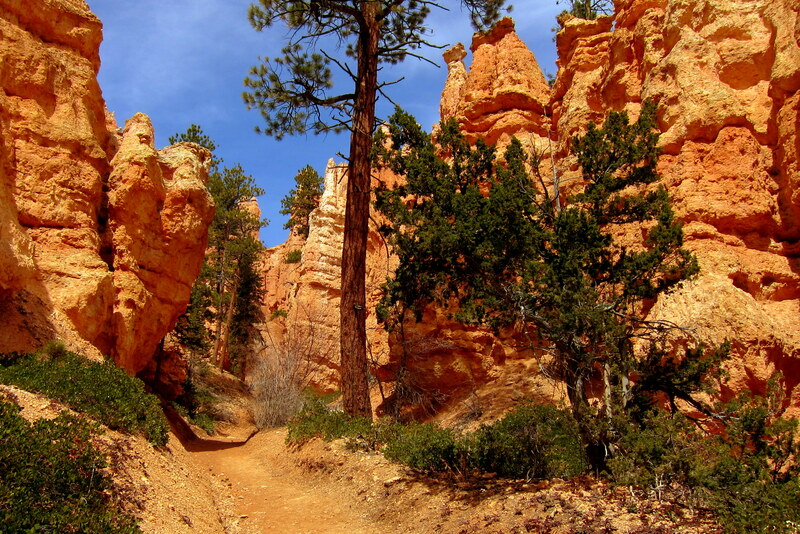 The overall elevation loss and gain on this hike was reported to be 1,631 feet, much of which came from the rise and fall of the Peekaboo Trail on the canyon floor. By comparison, most of my favorite trails back home feature more elevation change but are summit treks so the gain all comes in the beginning. 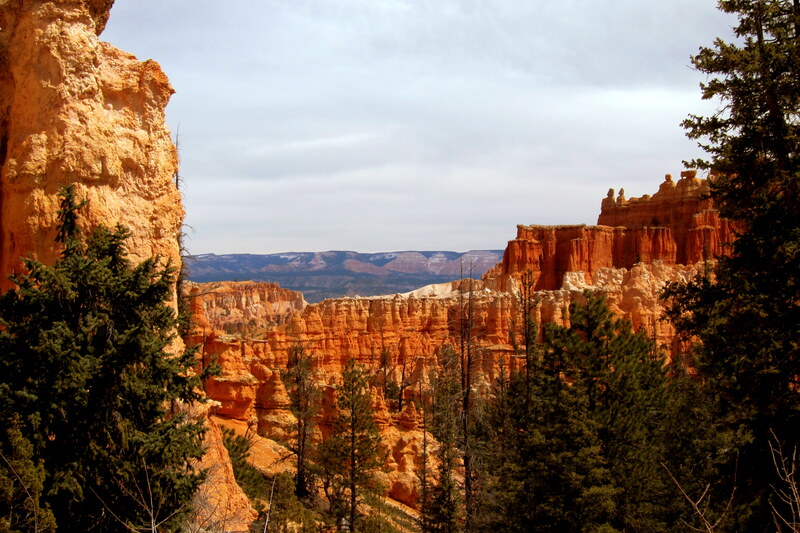 The hikes in Bryce Canyon require you to start at the highest elevation and descend, which of course means that at the end of the day, when you are likely the most fatigued, you have to climb back up to the canyon rim. However it is all well worth it. 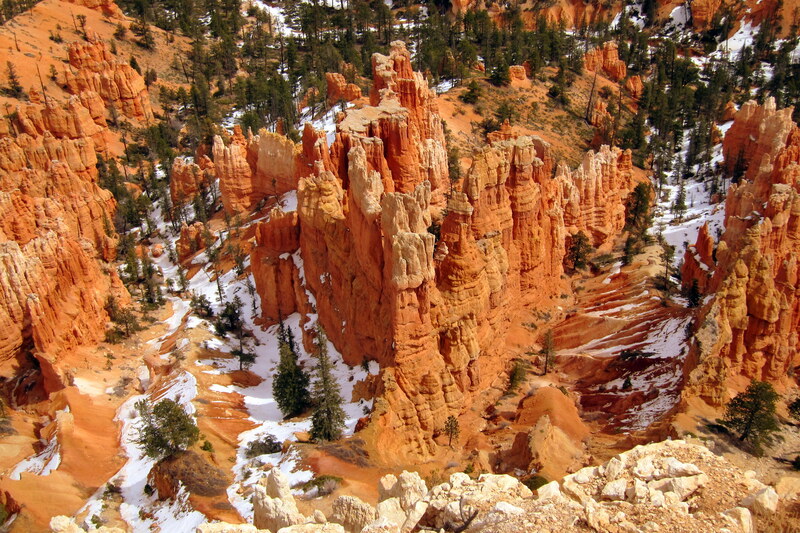 It is my opinion to truly experience the magic of Bryce canyon; one must make the trek to the bottom and pause frequently to take it all in. 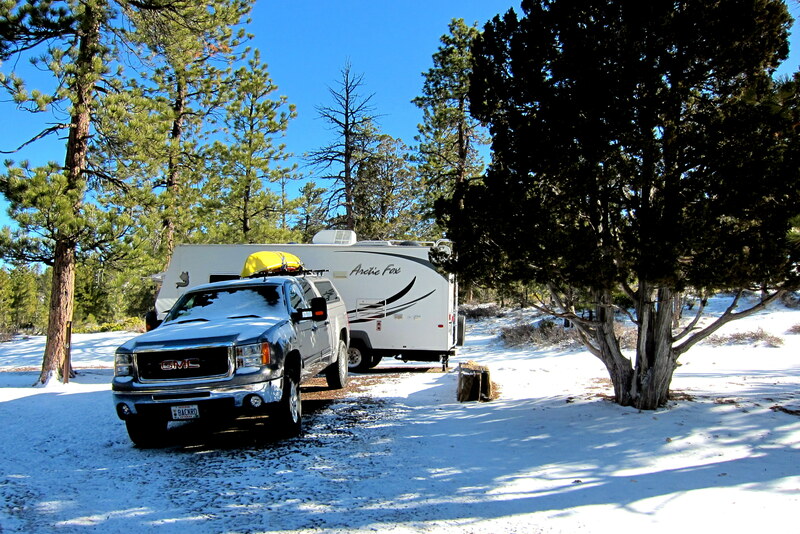 On the final morning, we woke to a blanket of new fallen snow and bright blue skies. The accumulation was less than two inches…..however with the wind blowing, drifts reached 5 inches or more! Fortunately with four wheel drive we were not camp bound so off to the visitor’s center once more to take a leisurely look at the films and displays. Since a few photos of the canyon with the fresh snowfall and blue sky as accents seemed appropriate…..we drove some of the park road and stopped at selected overlooks. 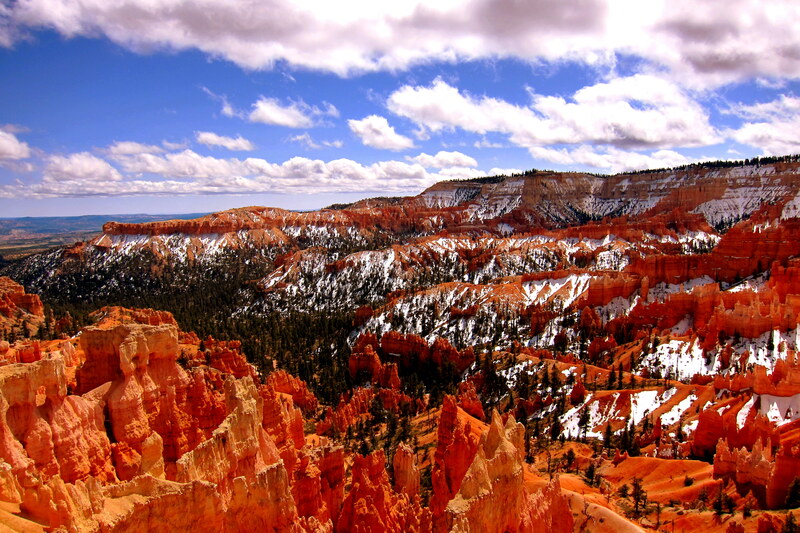 Like other National Parks we have enjoyed, Bryce takes on a different appearance depending on the time of day and the season of the year. 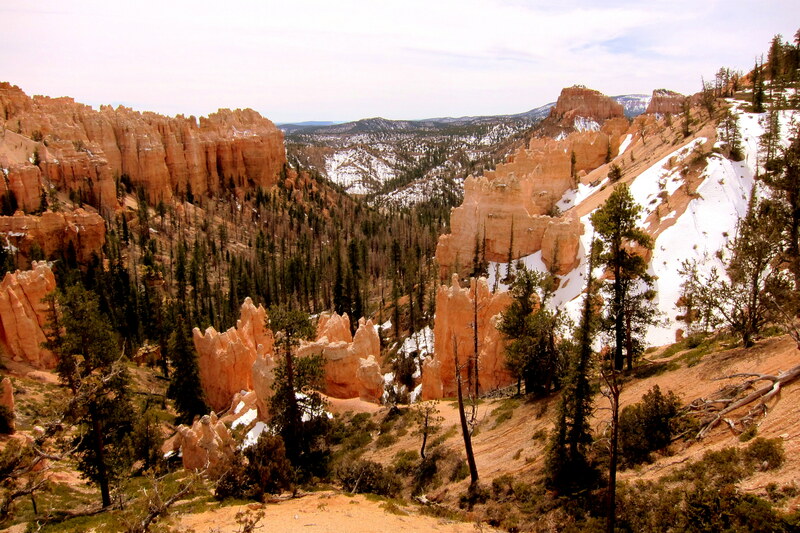 I bet today would be a great choice to trek down into the canyon and walk among the hoodoos, fins and spires. However the Rangers are advising against it as the snowfall combined with the overnight temperatures have made some of the trails a bit treacherous. Back at our campsite we visited with an interesting neighbor. 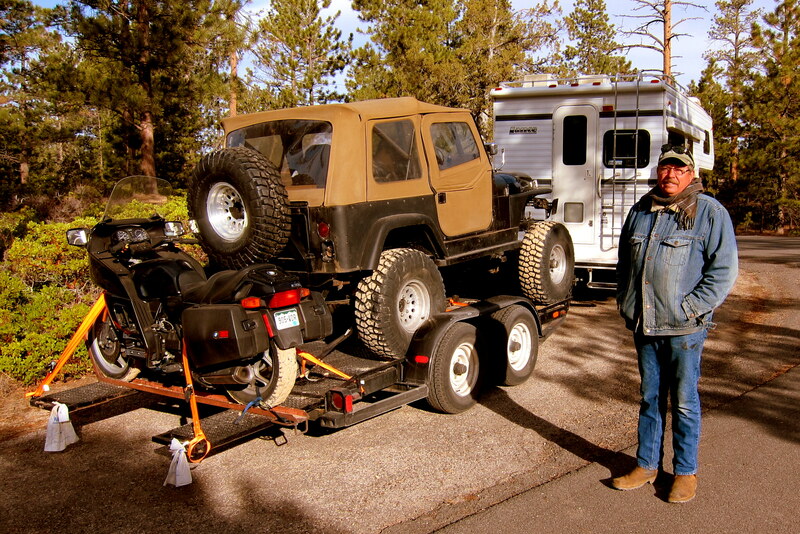 Dan, a retired HVAC engineer from Colorado, is traveling in a nifty rig. A one ton Dodge sporting a Lance camper, pulling a flatbed trailer housing a modified jeep and a BMW off road capable motorcycle…..now that guy has his priorities straight! Well tomorrow we head east, or maybe north, or maybe north east…..time will tell! 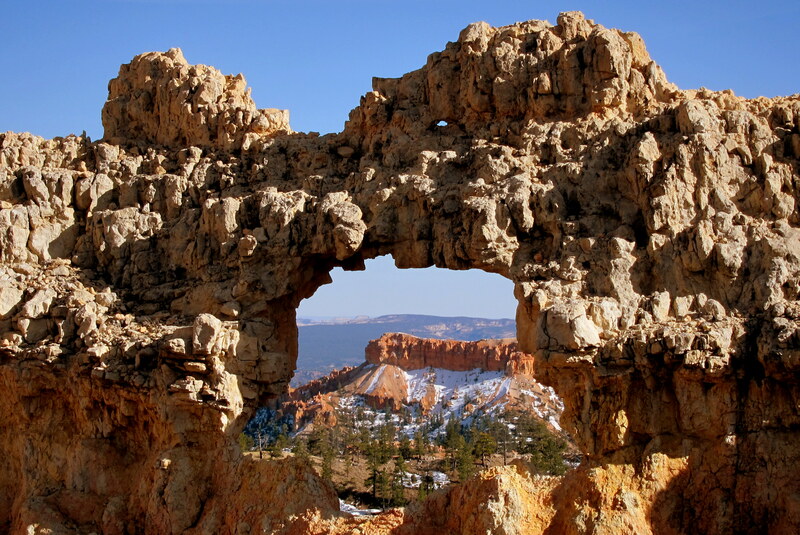 Kit’s Corner: We had a real nice and relaxing time in Bryce Canyon. Well, I should clarify; I had a nice relaxing time. Bill is always up and outdoors doing something, anything. He can’t be cooped up in the trailer during the daylight hours; it drives him (and me) nuts. So, I take the time to read, knit, play on the computer, get my little bit of housework done and fix dinner. This system works well for us as it gives us both time to do the things we enjoy. Bill, superb pictures. You ought to do a coffee table book. 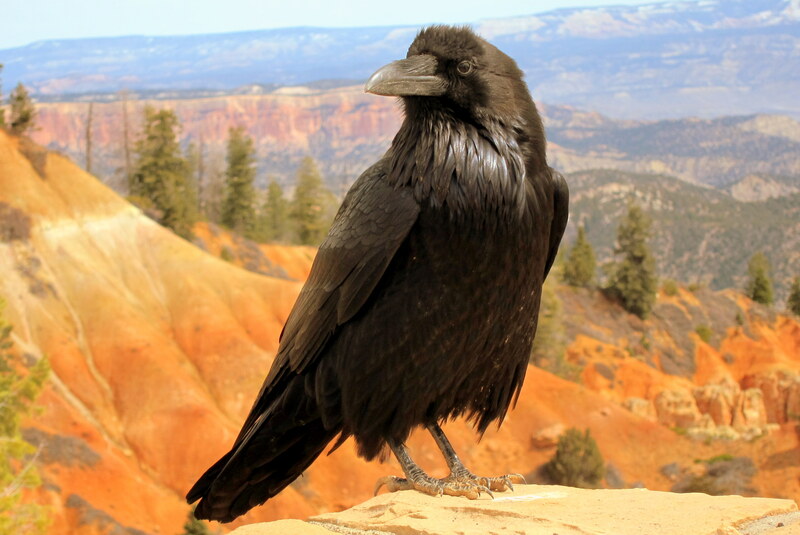 Love the raven as I told you before. You guys sure know how to get a lot out of life. See ya back in Brunswick before you know it. Thanks, your kind comment on my photography means a lot considering your high level of skill. See you all soon! who knew a ditch could be so photogenic. I wonder what kind of shots you could get by rigging a camera to one of your fancy kites. Might work…..I’ve seen aerial shots taken from a balloon borne camera. What a beautiful place! Great pictures Bill. 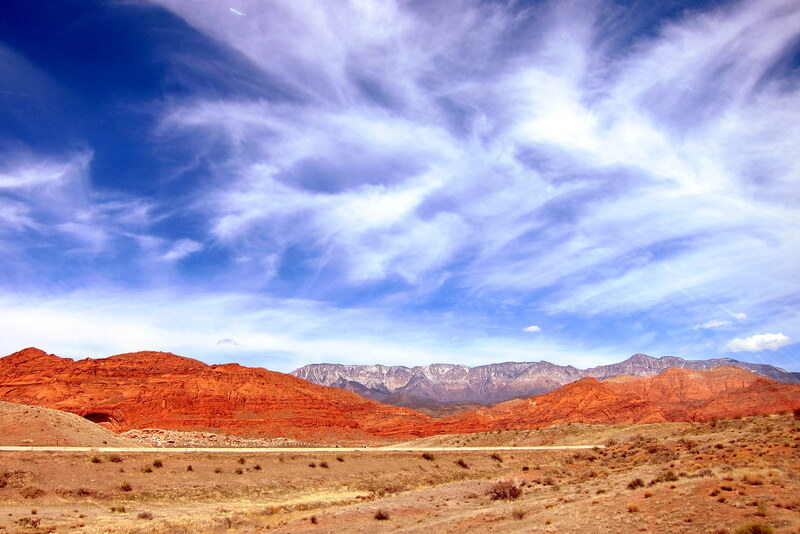 It is beautiful…..just one of many gorgeous spots in the US……hope to see them all eventually! Tell Winston to save me a spot at the OGBC table. Looking forward to seeing you guys soon! Brings back wonderful memories — great photos! Thanks, we will have to compare notes on our related visits to the National Parks. Reviewing the pictures you have nothing to “crow” about. Some great hiking eh? Hard to portray the beauty of the outdoors in a few pictures but you did a great job Bill. I’m sure Kit did some editing! Ha, ha….. Keep em coming, I’ll be in the mountains this weekend. Maybe send you a couple photos it I remember to bring my camera! Take care, give Kit a squeeze for me! Thanks for the nice comment. 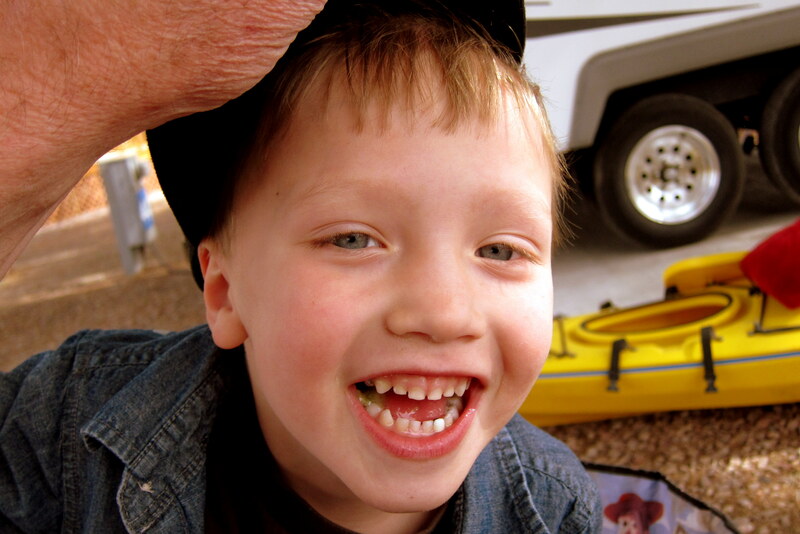 Have fun upta your mountain retreat…..please do send some photos. Wow, Bill, you did it again! What pictures! 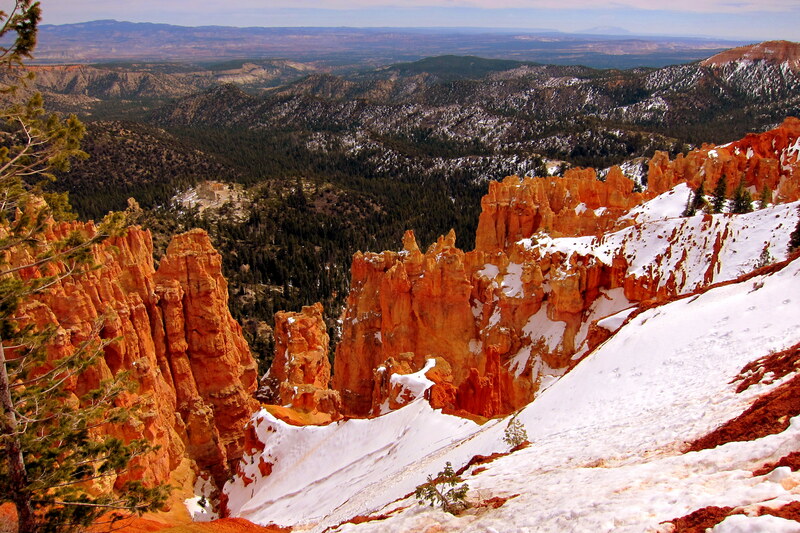 I’ve been to Bryce Canyon when there was snow too. Neat place to visit. You look kind of cold though!! I love that new-fangled camper….what an imagination that owner has. Have fun!!! Thanks, please let us know if you return home this summer…..would like to see you again. GREAT PHOTOS. I THINK YOU MIGHT HAVE WALKED BACKWARDS INTO THE CANYON AND THEN IT WOULD HAVE BEEN DOWN HILL COMING BACK OUT. NOW THIS YOUGERT THING, I HEARD THAT THE ELEVATION CHANGE HAS RESULTED IN MANY UNPLANNED OFFSPRING DUE TO CONDOM FAILURE. NOT SURE IF SNOPES HAS ANY DATA ON THIS OR NOT, JUST BE CAREFUL. HOW COME YOU DON’T CAMP ON SOME WARM SANDY BEACH ON THE KEYS SO I CAN SEE THE LATEST BIKINI STYLES? 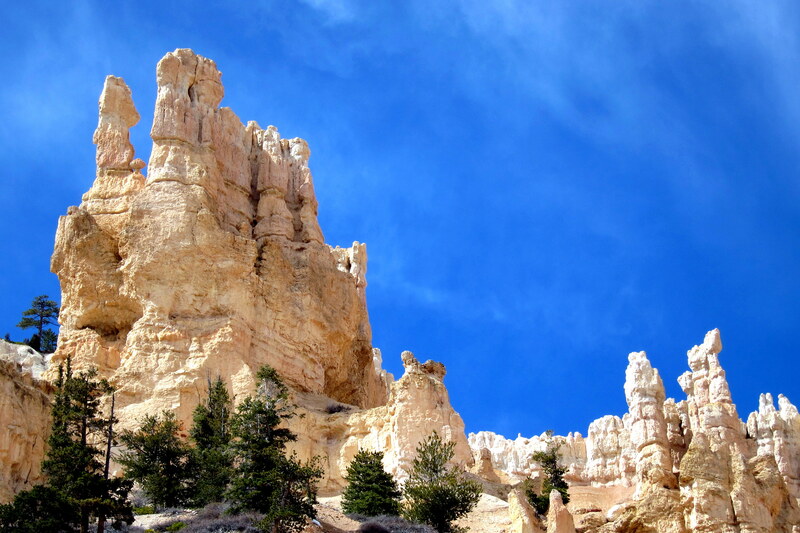 AT MY AGE MOUNTAINS MAKE ME FEEL OLDER, ESPECIALLY THOSE HOODOOS. Good point…..after all, I do everything else backwards! Warm sandy beaches are for wimps! Snow covered mountains is where it’s at. And besides you can always imagine the bikini’s under those parkas! Yea, that fact surprises us…..somehow we make it work, as you folks do as well. Love you, have a safe trip home! Look forward to seeing you soon!! Hi folks! 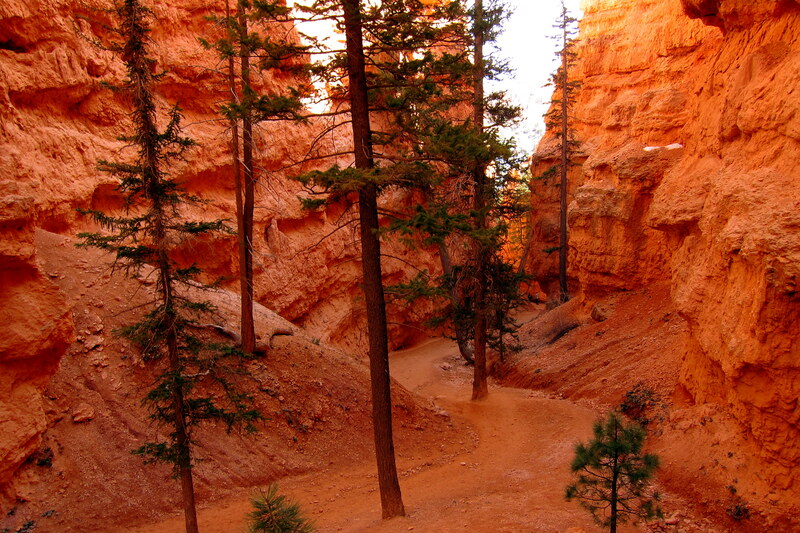 your recent trip to Bryce Canyon made us yearn to tour the Utah Nat’l parks again…SOON! 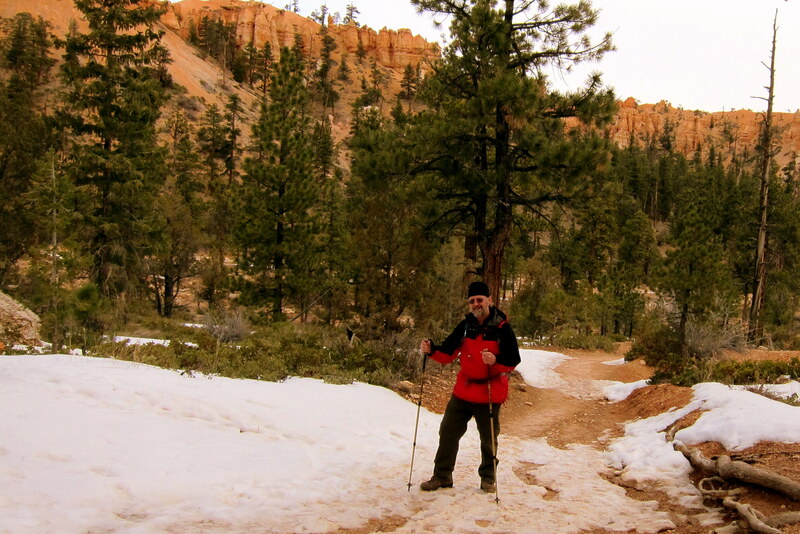 Just arrived back home at Bend, Oregon, after another winter on Snowbird Mesa…travel safe! Thanks, glad you all made it home safe. 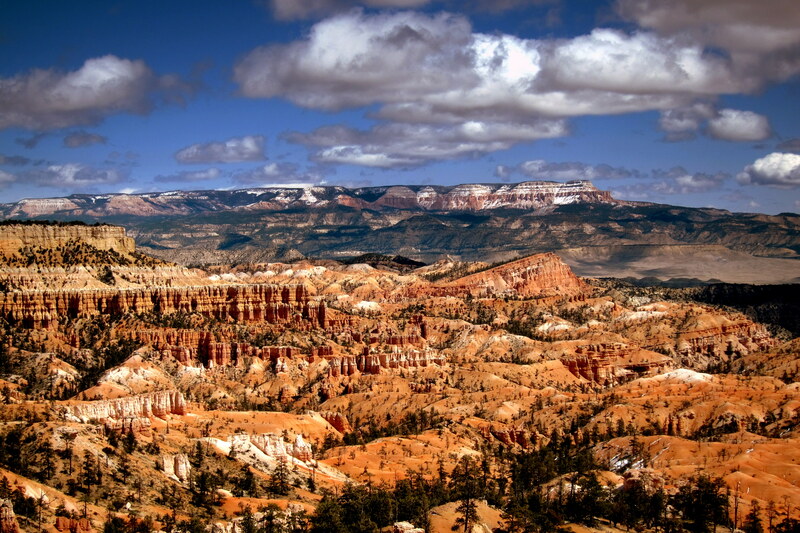 We absolutely love the National Parks of Utah, in our opinion they are nicer and often overshadowed by The Grand Canyon, which is a shame…..folks don’t know what they are missing!